Okay, first of all if you’ve read my blog you know my fascination with the Filipino restaurant chain Jollibee. When I was in the Philippines a couple of months ago I became addicted to their combination of fried chicken with spaghetti. Since then, except for a visit to one in Vietnam, it’s been absent from my life. Yesterday when I was riding the metro I saw someone carrying a Jollibee takeout bag. My eyes lit up and I was overcome with joy. Jollibee was in Singapore! I looked them up online last night and found, indeed, Jollibee was here. They had one location in Singapore. I took a quick look at the address and saw the word Orchard in it. There’s an Orchard MRT station so that’s where I headed this morning. This morning I packed all my stuff up, checked out, and left my bag for storage. I had a few hours til I had to leave for the airport and I was going to spend them getting me some Jollibee. I rode the MRT to the Orchard station and got off. I asked the ticket booth attendant where the Jollibee was and she had no idea what I was talking about. I guess that makes sense. I mean it’s not like it’s a household name like in the Philippines. I vaguely remembered it was in Orchard Plaza mall so she told me I had to get back on the MRT and travel to the last station. So, I hopped back on the train and got off at the next station. Although the handful of people I asked as I walked the street didn’t know anything about Jollibee, they did point me to Orchard Plaza. Hmmmm, it was a little strip mall with a bunch of tailor shops in it. 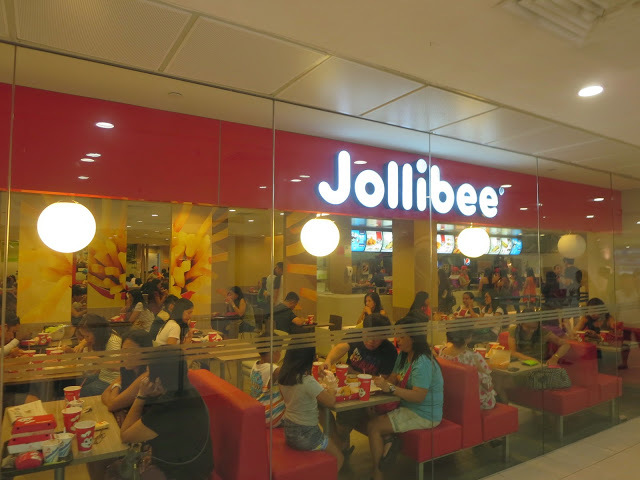 It certainly didn’t look like a place where Jollibee would open their one and only store in Singapore. I walked a little more and spotted a Starbucks. I stopped in to use their free wifi to look up the actual address of the restaurant. I didn’t have to though because the clerk behind the counter was Filipino and he knew exactly where the Jollibee was. It wasn’t at Orchard Plaza at all. It was at Lucky Plaza, on Orchard street. In my haste I just pieced the two together and got Orchard Plaza. The Starbucks guy pointed me back in the opposite direction and I walked another 15 minutes to get to the mall. As I approached the mall I actually was back in the vicinity of the MRT I had originally disembarked from. I was here – Lucky Plaza. Lucky Plaza is a mall with 6 levels. Escalator after escalator, the anticipation grew. I kept cranking my neck to see if I could spot it. And then I reached the 6th floor and there it was! Of course it was much more expensive than the Philippines as the meal that cost me $2 there cost me $10 here but, still, I was eating some Jollibee! It had taken a full hour to get there and by the time I was done it was time to head back to the hostel to pick up my bag and leave for the airport. I got to the airport pretty easily and I checked in around 2pm and spent the next couple of hours using their free wifi to put together the Zoo blog from yesterday. At 5pm I boarded my flight for Kuala Lumpur. Now flying into Kuala Lumpur has a bit of a stigma to it. After all they are still searching for that plane that flew out of this very airport. I know the chances of something happening are next to nil, but still, it crosses my mind every time I board a flight and even more so today considering the location I was flying to. In fact on my flight the other day into Singapore as everyone was boarding someone in a seat right behind me was asking around if a bag he found on his seat belonged to anyone. We all kind of turned around and looked. Then he said it was really heavy and we all kind of had that look. Turns out it was from someone who had dropped it in the wrong seat on her way to the bathroom, but still, there was that “is it a bomb in that bag?” moment. Anyway, we got to Kuala Lumpur without any problem. 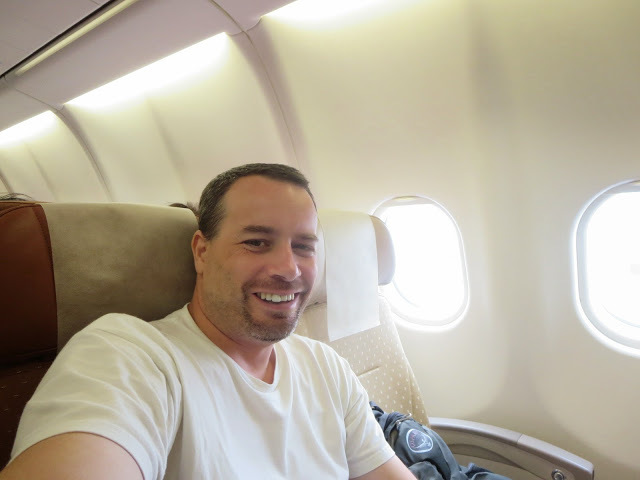 I flew on Singapore Airlines and although it’s a huge plane considering it was only a 40 minute flight, it was only about one third full. I learned something with customs – don’t go in the line behind people from India. The immigration officer seemed to take extra time questioning them and when it was finally my turn her first (and only) question was if I was coming from India. When I replied that I was coming from Singapore, she had no other questions and stamped me in. 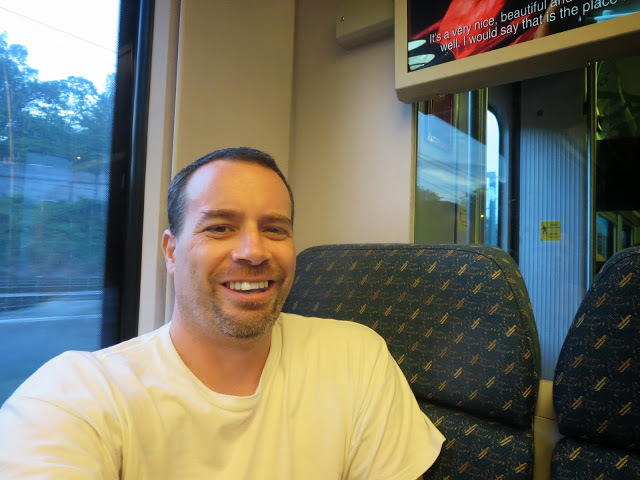 From the airport I took the nice KLIA Express train into the city. It cost 35 Ringgi ($11) but it was well worth it as we got into town quickly in about a half hour. The train went to KL Sentral which is a major hub for their metro lines. I had pretty clear instructions on how to get to the hostel from there but actually figuring out where to go in KL Sentral took a bit of guesswork. I did finally figure out my way and took the two stops to the neighborhood where my hostel is. Once again, when I got off the metro it was a little confusing on how to get out of the station even though all the signage was in English. Once I got my bearings, finding the hostel was no problem. After I had checked in to the hostel and gotten myself settled, I asked the front desk girl where a place to eat Malaysian cuisine was. It seems the area I’m staying in is predominately Indian and Chinese and for me to get something other than that cuisine I had to hop back on the metro and go a couple stations down the line. 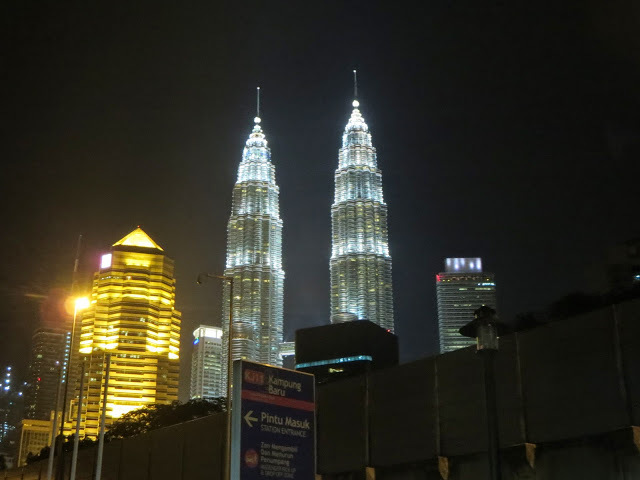 As I got off the metro I got my first glimpse of the two towers that Kuala Lumpur is most known for. They looked dazzling all lit up at night. 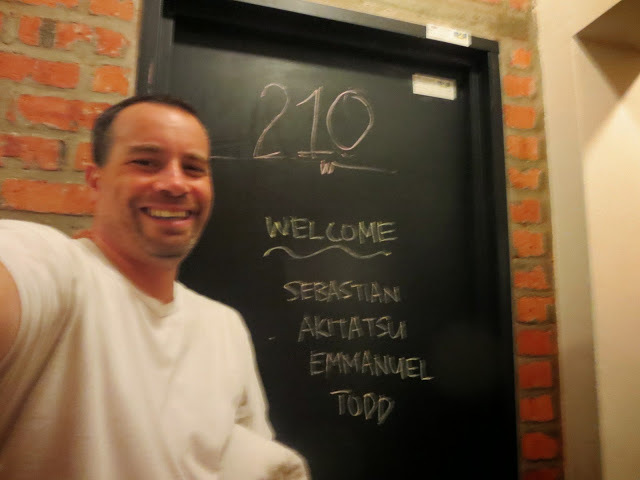 I also knew the girl at the front desk sent me to the right area – quiet little neighborhood, a bunch of locals, and street food stands. 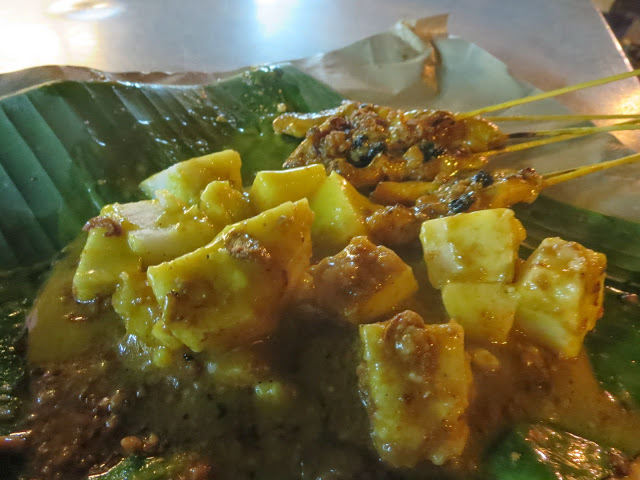 I found a stand selling chicken satay with potato and order some for 5 ringgit ($1.60). The dish was really good, authentic Malaysian food. I just made the mistake of not telling him to leave the spice out. By the time I was done the meal I was sweating pretty good – some from the hot weather but mostly from the heat of the dish. I walked a little further down the street and spotted a hamburger stand. He was making burgers wrapped in fried egg. 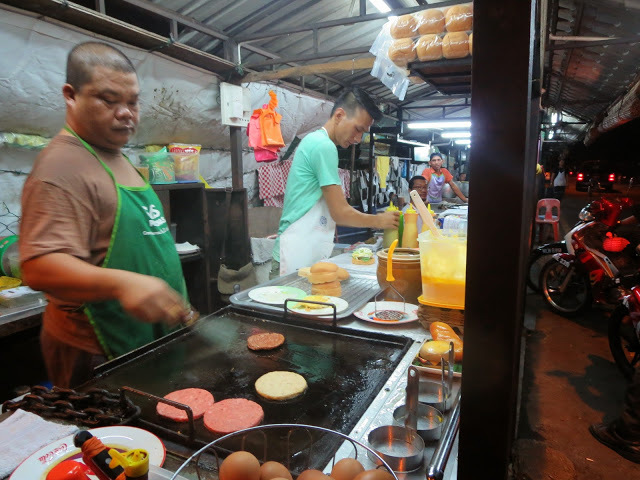 The prices were cheap so I went all out and got a double hamburger wrapped in egg (3.50 ringgit, $1.20). Messiest burger I’ve probably ever had. Also one of the best. After all that food I hopped back on the metro and back to the hostel. It was a long day and, not surprisingly, another day dominated by food and the quest for it. It’s gonna be hard to go back home and not eat out every day. I’m going to miss it but I’m also excited to go home too. 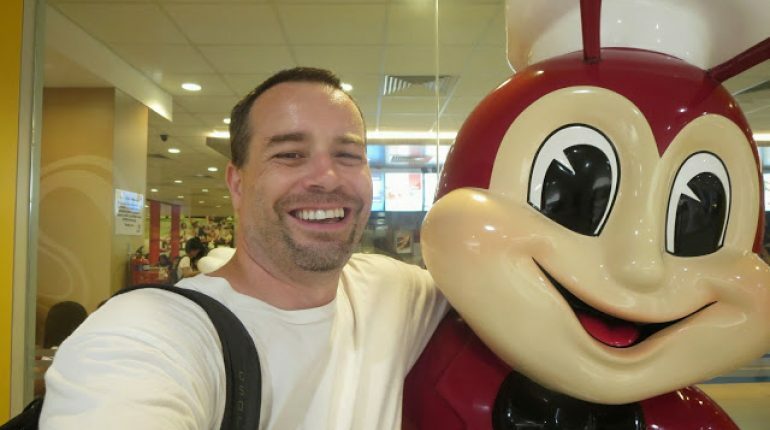 Nice blog… I’m just really amazed about the jollibee thing I’m a Filipino and it makes me pround.